No. 1 WBO Contender Warlito Parrenas can't bring home the title. Parrenas vs David Carmona of Mexico ended in a split draw. The KO artist Warlito Parrenas (21W(21KO)-6L) of Cadiz City, Negros Occidental, Philippines seems dominated and the most aggressive in the fight. 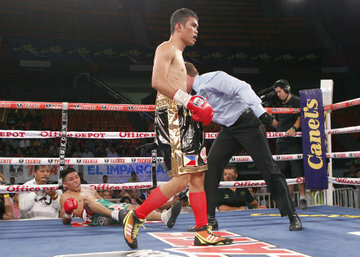 He was also knock down Carmona in the 2nd round of the fight. Carmona whose has been hurt in a couple times, scored by his counter punching skills. The fight was ended via split draw 115-112 for Carmona, 115-113 for Parrenas and the other one is 114-114. The belt remains vacant, Naoya Inoue of Japan will choose if the wants to have a rematch against Omar Narvaez of Mexico or he can choose between Parrenas and Carmona.